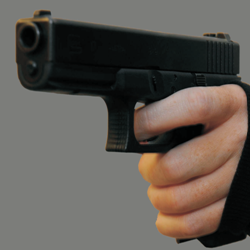 Non-restricted firearms must be unloaded, AND made inoperable with a secure locking device such as a trigger lock, or have bolts or bolt carriers removed or securely locked in a sturdy container, cabinet or room that cannot be easily broken into. Ammunition must be kept in a location where it is not available for loading the firearm, unless both the firearm and its ammunition are securely locked up. Bolts or bolt carriers must be removed from automatic firearms if they are removable, and stored in a separate locked room that cannot be easily broken open or into. In areas where it is legal to fire a gun, non-restricted firearms needed for predator control can temporarily be left unlocked and operable, but they must be kept unloaded and all ammunition must be stored separately. Non-restricted firearms do not have to be locked up or made inoperable in a remote wilderness area. They must be unloaded, but the ammunition can be kept nearby.< >made inoperable with a secure locking device such as a trigger lock, AND locked in a sturdy cabinet, container or room that cannot be easily broken into, ORLocked in a vault, safe or room that was built or adapted for storing these types of firearms. Non-restricted firearms must be unloaded. locked in a sturdy opaque container. The bolt or bolt carrier must be removed from automatic firearms if it is removable. Replica firearms must be locked in the trunk or in a similar lockable compartment. If the vehicle does not have a trunk or compartment that can be locked, the firearms and replica firearms must be placed out of sight inside the vehicle, and the vehicle must be locked. Firearms will only be released at a pre-scheduled appointment. Appointments to retrieve firearms can be scheduled through the Belleville Police Service Property Management Unit. Firearms in possession of the police service that are subject to release via court order can only be released when the Property Management Unit has received a copy of the court order, authorization from the Investigating Officer, and the thirty-day appeal period has passed. When retrieving your firearm at your scheduled appointment, you will be required to produce proof of registration and all valid firearms licenses and registration certificates. If the firearm being retrieved is a restricted weapon, you will be required to produce an Authorization to Transport (ATT) from a Chief Firearms Officer. You can apply for an ATT by calling 1-800-731-4000. To be eligible for an ATT, you must have a valid firearms licence authorizing you to possess restricted firearms. You must have a proper trigger lock and lock box in your possession to transport the weapon for the weapon to be released to you.